A friend of mine brought back some spices from India to remind me of the scents of the country. 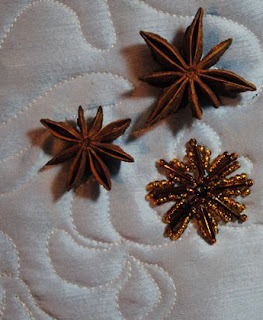 Among them was star anise. According to Wikipedia, star anise "is a spice that closely resembles anise in flavor, obtained from the star-shaped pericarp of Illicium verum, a small native evergreen tree of southwest China. The star shaped fruits are harvested just before ripening." I was really taken with the star shape of the fruit and could envision it in an art quilt. So, I have been playing with a beaded rendition of the shape. Here is where I have gotten to. You can see the original dried seedpods and my beaded interpretation. Will keep you posted on how this develops. I have one more beaded design idea to play with. What a beautiful fruit! I love your beaded version!